Democrats Abroad Switzerland: DACH Zurich Chapter 2011 Elections - Call for Candidates "We Need You!" DACH Zurich Chapter 2011 Elections - Call for Candidates "We Need You!" 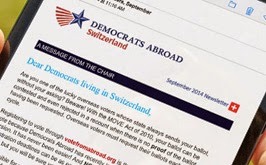 In 2009 Zurich became an official chapter of Democrats Abroad Switzerland (DACH). This gave the German-speaking region a spot on the DACH Executive Committee and signaled an effort to develop a sustainable organizing effort in and around Zurich. Since then Jennifer Giroux has been the defacto chair for the group while working with local members to explore future leadership potential. Well, with the 2012 elections around the corner now is an excellent time for new leadership to come to life! Before going forward with the elections, however, we are seeking candidates! If you are interested in participating in the leadership functions of the group and what to learn more about what this entails OR announce your candidacy, then please come to the next DA Zurich gathering on August 24th at the Reithalle Restaurant in Zurich. Once we have candidates to run for these 2 positions we will send an announcement to the group with details on the voting time-frame and procedure. I would like to be more involved. What does each position require? Chapter Chair: The duties of the Chair include participating in monthly conference calls (via skype) with the DACH Executive Committee (ExCom) and creating a Zurich Chapter meeting schedule. Meetings can be whatever you like - for example, they can mimic the same schedule and event plans as another DACH group (i.e. if Geneva is having a happy hour then Zurich has a happy hour during the same week/day) OR you can customize meetings and events as you like. It’s flexible, relaxed, and up to you! Of course there are times when there will be countrywide meeting themes (such as voter registration drives). In terms of time requirement, the ExCom meetings typically take 1-2 hours per month. In addition, monthly or bi-monthly group meetings can absorb another 3 hours on average. This particular Chapter election cycle is exciting, as candidates will have the chance to experience organizing during a presidential election year! Do I have to be a member of Democrats Abroad to run? Do I need experience in politics or community organizing to run or manage group activities if elected? I have more questions that were not listed here, who can I talk to? Democrats Abroad is a 100% volunteer organization. We need you to get involved!